Hosted by Port Metro Vancouver, the Canada Day Parade celebrates 150 years of Canada by bringing bright and colourful performances to the streets of Downtown Vancouver. 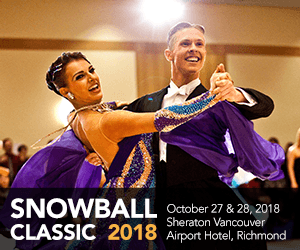 With well over 100 entries, ranging from cultural groups to marching bands, our aim is to enlighten Vancouver with the wonderful world of Ballroom Dancing! Plan for lots and lots of dancing! The Canada Day Parade is an experience you’ll never forget! Send an email to canadadayparade@dancesportbc.com . We will keep you up to date with practice sessions, answer any questions and let you know the time and location details for the day of the parade. Yes, the Parade is happening on Sunday July 2nd, the day after Canada Day. The tentative meeting time will be 3:30 pm near Broughton and Alberni. This part of downtown will be closed off to vehicles and very busy, so public transit should be the easiest method to get there. Bags and personal items can be stored and kept safe in the truck, please keep to a minimum. Wait! What do I Dance? Don’t fret! We have simple routines that all dancers can learn in no time! Wednesday June 28th at 6:00 pm – Free BBQ following parade practice! 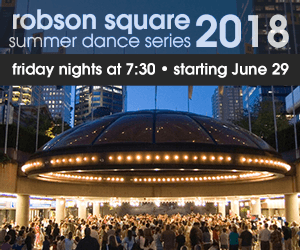 The parade float is organized by the Robson Square Summer Dance Series Committee, with support from DanceSportBC and the Roy Hamlyn Foundation.